It has been almost ten years since Unified Entry Examinations (UEE) for university admissions were introduced in Georgia, and the introduction of UEE has been named by the World Bank as one of the most successful reforms implemented since the Rose Revolution. Previously, university admissions were directly administered by the higher educational institutions, and entrance exams were often the site of highly corrupt practices. UEE ultimately led to the complete elimination of corruption and nepotism from the admissions process. Corruption aside, fair and exclusively merit-based UEE were expected to give a better chance to applicants from outside Tbilisi, including representatives of ethnic minorities, to enroll in the best educational institutions in Georgia. Some, largely unsystematic evidence, however, suggests that this expectation has not been met. While at present, we do not possess longitudinal data which would enable us to draw comparisons between the situation before and after the reform, we do have data to look at how admitted applicants from different regions of Georgia performed on the 2014 exams. The publicly available 2014 UEE database contains scores for all exam takers (about 26,000 individuals) along with basic demographic data about them, such as date of birth, gender, and municipality where the applicant was registered at the time of exam. It should be noted that the applicants’ place of registration does not necessarily accurately reflect their actual place of residence in Georgia, since no one is obliged by law to live in their place of registration. This is especially true for IDPs, who despite being registered in Abkhazia or South Ossetia, in fact generally reside in areas controlled by Georgia, mainly in Tbilisi (40% of the whole IDP population) and Samegrelo-Zemo Svaneti (32%). However, registration data still makes sense as many people in Georgia, especially the youth graduating secondary schools, generally live in their place of registration. 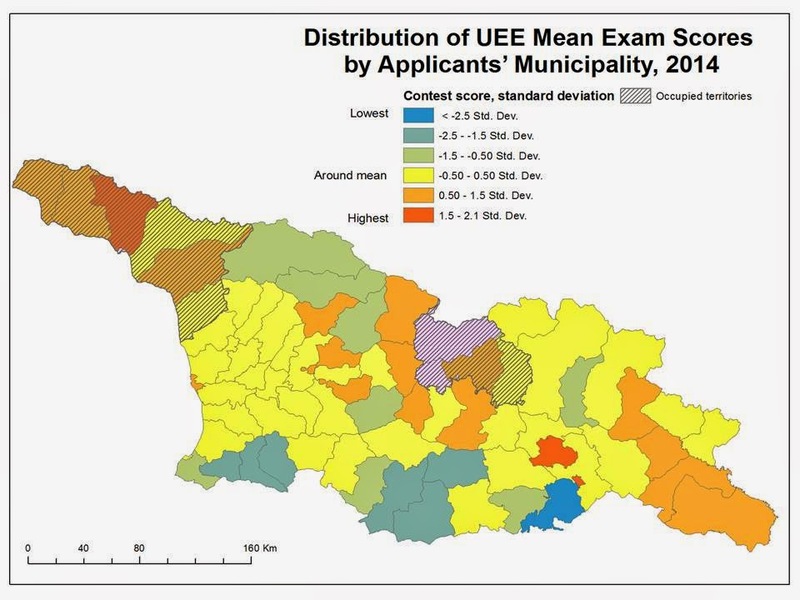 The map below displays the distribution of UEE scores by applicants’ municipality in 2014. The municipalities on the map below have been assigned a color based on the standard deviation of the applicants’ mean scores. Standard deviation indicates how distant a particular data point, an exam score in this instance, is from the mean. It also “quantifies the amount of variation or dispersion of a set of data values.” On the map, negative standard deviations indicate values less than the national mean, while positive ones indicate values above the national mean. Looking at the regional distribution of mean exam scores on the map above, a number of patterns can be observed. High and low scores are concentrated territorially and form distinct geographic patterns. Applicants from the capital and large urban areas (Kutaisi, Batumi, Rustavi, Poti) on average have received the highest scores. Another area of concentration of high scores can be observed in Kakheti. The performance of representatives of municipalities from the central-western parts of Georgia was slightly worse (Racha-Lechkhumi, eastern municipalities of Imereti, as well as Khashuri and Gori). Interestingly enough, IDP contestants’ results are also quite high, especially those registered in Sukhumi municipality. Municipalities with predominantly non-ethnic Georgian populations have the lowest mean exam scores in the country. Applicants from Marneuli, Bolnisi, Akhalkalaki, Ninotsminda and Tsalka municipalities performed the worst on average during the last UEE. Upper Adjara and Svaneti are two other areas with concentrations of low scores. UEE scores portray a larger problem with the education system in Georgia – regional inequality of access to quality education. Applicants coming from regions and especially ethnic minority applicants are less likely to score high on exams even though they provide everyone with an equal chance. Moreover, provided that advanced knowledge of the state language – Georgian –was necessary to pass the exams, to a certain extent, the UEE discriminated against ethnic minority exam takers, especially those from Samtskhe-Javakheti and Kvemo Kartli, who are often not fluent in Georgian. Despite the fact that the National Assessment and Examinations Center (NAEC) quickly acknowledged this latter problem and, starting from 2010, offered exams in minorities’ native languages (Armenian, Azerbaijani and Russian), as it is clear from the map above, the disparity between predominantly Georgian-speaking and ethnic minority municipalities remains. This blog post described regional disparities in terms of UEE exam scores in Georgia. In the next blog post, we will investigate whether gender and settlement type impact UEE scores. Despite the above explanations for regional disparities not being exhaustive, they give some food for thought and discussion. Have other insights? Join the conversation on our Facebook page or in the comments section below.